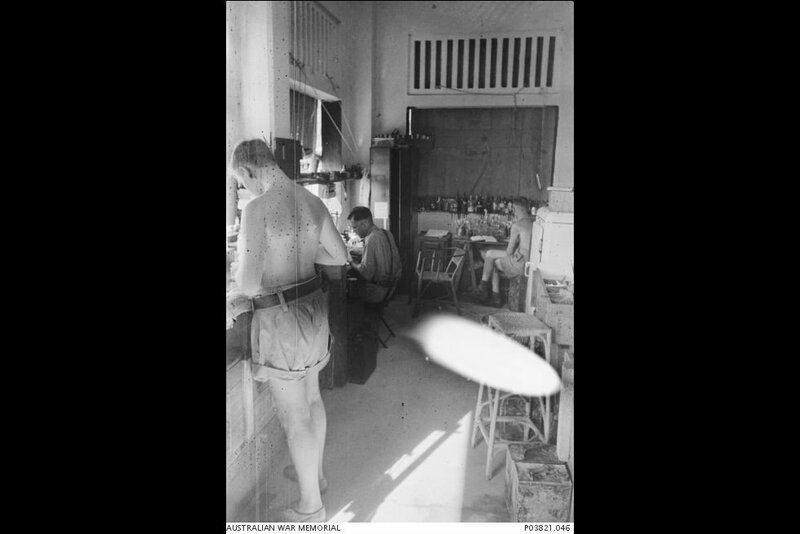 A medical laboratory set up by prisoners on the ground floor verandah of a barracks block in Changi POW Camp. Members of the 2nd Mobile Bacteriological Laboratory carried out elementary clinical pathology, diagnosis and administrative work, as well as research into malaria prevention, 1942. Image courtesy of Kennedy B Burnside, Australian War Memorial. 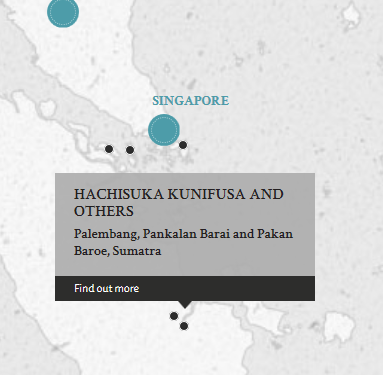 The defendants were charged with ill-treatment of POWs in their custody at several POW camps in Sumatra. Alleged ill-treatment included inadequate accomodation facilities, shortage of food and medical supplies, restricting the supply of rations to POWs, arbitrary and brutal beatings, denying POWs food and using the food to feed livestock instead, forcing the POWs to give up their personal posessions, rampant diseases, wilful neglect of the sick and forcing sick men to work. This ill-treatment resulted in the physical and mental suffering as well as deaths of POWs. The American Red Cross provided relief supplies to the POWs in the camp. The supplies were not given to the prisoners. It was claimed that the Japanese soldiers and guards took them. Translation issues hindered court proceedings. Hachisuka, Kunifusa. Captain. From Japanese military. From Japan. Guilty. Death by hanging. Sentence confirmed. Yamakawan, Yasuji. Lieutenant. From Japanese military. From Japan. Guilty. Death by hanging. Sentence confirmed. Nakai, Kosuke. Lieutenant. From Japanese military. From Japan. Guilty. Death by hanging. Sentence reduced. 15 years' imprisonment. Ito, Katsusaburo. Sergeant. From Japanese military. From Japan. Guilty. Death by hanging. Sentence confirmed. Onishi, Shigezo. Sergeant. From Japanese military. From Japan. Guilty. Death by hanging. Sentence confirmed. Kurata, Takeo. Sergeant. From Japanese military. From Japan. Guilty. Death by hanging. Sentence reduced. 15 years' imprisonment. Shirakawa, Rakushaku. Korean Guard. From Japanese military. From Korea. Guilty. 18 years' imprisonment. Sentence reduced. 10 years' imprisonment. Takayama, Haremitsu. Korean Guard. From Japanese military. From Korea. Guilty. 20 years' imprisonment. Sentence reduced. 10 years' imprisonment. Matsumoto, Harayoshi. Korean Guard. From Japanese military. From Korea. Guilty. Life imprisonment. Sentence reduced. 15 years' imprisonment. Kobayashi, Torao. Korean Guard. From Japanese military. From Korea. Guilty. Death by hanging. Sentence confirmed. Ishihara, Tatsuo. Korean Guard. From Japanese military. From Korea. Guilty. 20 years' imprisonment. Sentence confirmed. Rayama, Tekuichi. Korean Guard. From Japanese military. From Korea. Guilty. Life imprisonment. Sentence confirmed. Ohara, Seiichiro. Korean Guard. From Japanese military. From Korea. Guilty. Death by hanging Sentence reduced. Life imprisonment. Kaneyama, Shoryu. Korean Guard. From Japanese military. From Korea. Guilty. Death by hanging. Sentence reduced. Life imprisonment. Kaneshiro, Kiei. Korean Guard. From Japanese military. From Korea. Guilty. 12 years' imprisonment. Sentence reduced. 10 years' imprisonment. Watai, Jiro. Korean Guard. From Japanese military. From Korea. Guilty. 20 years' imprisonment. Sentence reduced. 10 years' imprisonment. Kimura, Tasei. Korean Guard. From Japanese military. From Korea. Guilty. 21 years' imprisonment. Sentence reduced. 10 years' imprisonment. Kurekawa, Zentaku. Korean Guard. From Japanese military. From Korea. Guilty. Life imprisonment. Sentence reduced. 10 years' imprisonment. Yasuda, Yoshi. Korean Guard. From Japanese military. From Korea. Guilty. 10 years' imprisonment. Sentence confirmed. Tomoda, Shakujin. Korean Guard. From Japanese military. From Korea. Guilty. 3 years' imprisonment. Sentence confirmed. Okano, Sakae. Korean Guard. From Japanese military. From Korea. Guilty. 15 years' imprisonment. Sentence reduced. 10 years' imprisonment. Miyama, Takamine. Korean Guard. From Japanese military. From Korea. Not guilty. Kanemoto, Yoshio. Korean Guard. From Japanese military. From Korea. Guilty. 15 years' imprisonment. Sentence reduced. 10 years' imprisonment. Kuwa, Ryushoku. Korean Guard. From Japanese military. From Korea. Not guilty. Mostyn, F. E. Major. From British military. LL.B. (Cantab), Law student. Araki, Tatsuo. Judge, Nagoya District Court. Ebayashi, Yososhi. Judge, Tokyo District Court. Wait, R.T. From British military.